Let’s go to Africa. There we will learn about traditions from South Western Africa and study the beauty and power of the leopard. Do you know where Africa is? Africa is a large continent. It is more than three times the size of the continental United States. It is the homeland of many different countries with many different ways of life and different styles of art. What do we know about art? We know that art is something that teaches us about the values people in a community hold most dear. We know that people from many times and places have made art. We know that art is not just something that expresses beauty. Art can be functional as well. What does this mean? It means art can be used in some way. In what way? Art can be worn or used in ceremonies to honor family, to show status and power of leaders, to teach values, or to express a community’s or an artist’s deeply held beliefs. While some of the works in the African gallery are functional in that they are meant to be worn and used primarily in ceremonies, other works of art in the African gallery are not meant to be worn and used in ceremonies but are meant to be displayed. Take a moment to look around. You’ll see older works of African art as well as new African art and will learn that African artists can remain connected to artistic traditions at home, while at the same time they can play key roles in artistic trends around the world. Look carefully at this pendant. Is there anything you wonder about? Does it look like some kind of animal? Does it look like a leopard? What do you know about leopards? Are they an endangered species? The leopard is the smallest of the big cats, which include the tiger, lion and jaguar. Leopards are listed as a “Near Threatened” species. They once roamed from Siberia to South Africa but have greatly declined in numbers due to hunting and loss of habitat, although they can still be found in healthy populations in sub-Sahara Africa and in smaller numbers around the world. A leopard has short legs, a long body, a large skull and powerful jaw and has fur marked with rosettes (spots). A leopard is a successful hunter. It uses its powerful jaw to take down large prey and carry them into the trees. 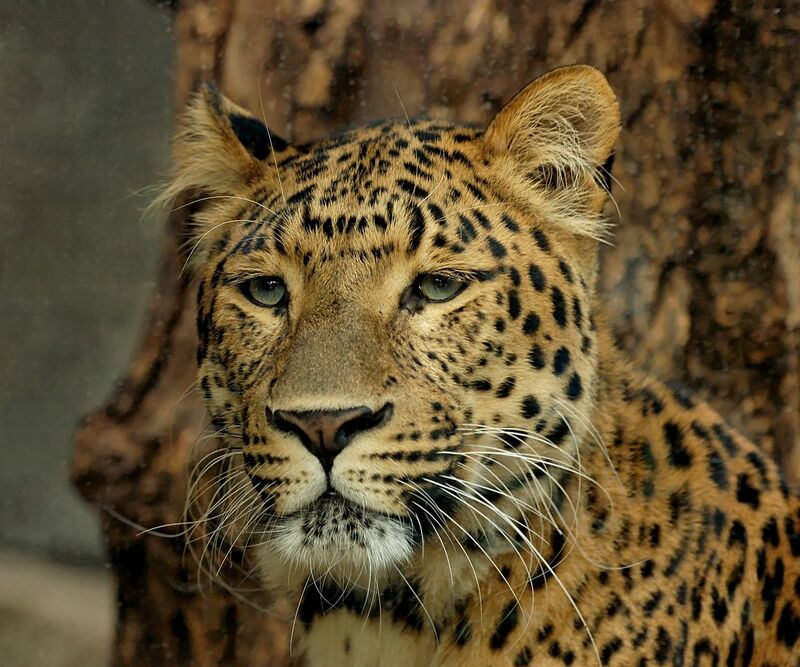 Leopards can adapt to many different kinds of habitats but are found mostly in savannas and rain forests. A leopard can run at speeds approaching thirty-six miles per hour and can easily climb trees even when carrying prey. Leopards are mostly solitary and nocturnal and are ferocious. Do you know what it means to be nocturnal? It means that leopards are mostly active during the night and sleep during the day. Look carefully at the leopard’s features on this pendant. What do you see? It has overlapping fangs, whiskers at each side of its face, large eyes and leaf-shaped ears. Copper tacks represent the animal’s spots. Small metal rattles or bells hang from loops at the bottom. Do you think this pendant had a function? Yes, it did. 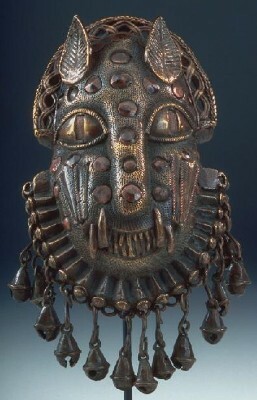 Long ago, warrior chiefs of the Edo peoples from Benin Kingdom in Nigeria would wear a pendant like this. The warriors would use it to fasten their kilt, which is a type of wrapped skirt. Why do you think Benin warriors would wear a pendant like this with an image of a leopard on it? Leopards represent the strength and power of the oba, revered by Edo peoples as the divine king of the Benin kingdom, as well as his cunning and intelligence. Since the leopard was a symbol of royal power, only the king could determine its use. The king would grant to his warriors going into battle the right to wear the image of a leopard, and with his approval, officials could carry a pendant like this on business to get safe passage.You may be interested to know that when this pendant was made hundreds of years ago, the king kept tame leopards at his court! Imagine that! “A stranger came out of the forest and strolled about a peaceful village in silence. The stranger was handsome, and all the maidens admired him and wished he would choose one of them to be his wife. But he remained at a distance and approached no one. He then returned to the forest and disappeared. Now the maiden was a stubborn girl. She would not heed the stranger’s warning and ran on. She followed him far into the forest to the gnarled roots of a great tree. There on the forest floor at the foot of the great tree lay the skin of a leopard. The stranger began to sing a sad song. He told the maiden that once a month he was allowed to wander about the village like a man, but this was only a disguise for in truth he was a savage leopard and would tear her to pieces as soon as he turned back into his natural form. Saying these words, he flung himself upon the ground and as if by magic turned into a snarling leopard. He immediately began to pursue the terrified girl. Does this leopard pendent remind you of the snarling leopard in our story? Do you think it is magical? Powerful? Beautiful? Perhaps for the people who made this pendant long ago, the image of a leopard was powerful and full of magic. If you use your imagination, perhaps you too can feel the power of the leopard. As for myself, when I look at this pendant I can imagine a leopard prowling around at night searching for prey. I can even hear his grunts and roars and growls and meows! The Leopard Hip Pendant is on view at the North Carolina Museum of Art in Raleigh, North Carolina. It is on display in the African gallery in the East Building at the museum. It will be well worth your time to visit and see all the wonderful works of art by African artists! Or perhaps you would like a tour. Tours of the collection are given daily, except for Monday when the museum is closed to the public. If you prefer, you can contact the museum ahead of time and arrange for you and your friends to have a private tour. I’m sure a docent at the museum would be happy to show you and your friends some wonderful works or art. Whether you visit the museum on your own or have a tour with a docent, it will be well worth your time!